Previously we mentioned about Intel Officially Named its Nehalem as Core i7 processor, now seems that this largest semiconductor manufacturer has finally ready to ship its next generation high end processor within next two weeks targeted for desktop platform. 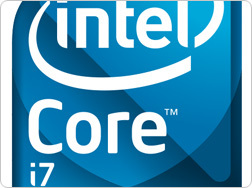 Core i7, or better known as Nehalem (codename) is based on a totally new Intel micro architecture with native quad-core on a single die and is claimed to be one of the fastest processor in the world. There are three different SKU (Stock Keeping Unit) that are expected to be launched this round. Lining up from entry to extreme models, there are Core i7-920 (2.66GHz), Core i7-940 (2.93MHz) and Core i7-965 (3.2GHz) targeted specifically for mainstream quad-core desktop platform. Intel further disclosed the expected selling price with batch quantity of 1000 units at $284, $562 and $999 per unit respectively. The first shipment will commence on November 17th, which is less than two weeks from now. Nevertheless, mobile users may have to wait till second half of next year before Core i7 is ready in mobile platform due to its extremely high TDP (Thermal Design Power) ranging from 130W to 150W.